This Saturday we’ll be pouring wines from some very exotic places. We have wine from Macedonia, Lebanon, Paarl, and the Island of Madeira. They are not your typical wines. Their flavors match their diverse locations. Come Explore! The Tikves winery is one of the largest and oldest in Macedonia, and uses sustainable practices in its winemaking. Rkaciteli-pronounced “rkah-tzeetely”, and meaning “red stem”-originated in Georgia (where it is spelled “Rkatsiteli”) and is one of the oldest known grape varieties. The origins of Rkaciteli date back to at least 3,000 BC, as determined by archaeological digs and carbon dated seeds. From the Barovo Vineyards at an altitude of 1800 feet on the Kozuv Mountains, the wine has a golden-yellow color giving away scents of fresh mango, peach, grapefruit and pineapple. Chateau Musar started in 1930. Their vineyards are located in the Bekaa Valley and in Mount Barouk, around Kefraya and Aana, are certified Organic. The Bekaa Valley sits 3,000 feet above Sea level and receives an average of 300 days of sunshine annually, 39-78 inches of rain per year. The soil is predominately gravelly with a limestone base. Musar Jeune has apricot and green fig notes. Its lemony acidity is balanced by its full fruit and dry minerality. Tormentoso’s Mourvedre comes from a dry farmed vineyard in the Paarl region of South Africa. They named the winery for drama, torment, and struggle. “All of these seem apt when you consider where our grapes are grown.” A portion of Syrah from the same region is blended to add complexity to the wine. The nose of berry fruit is complemented by fynbos (heather/bracken) and soft spice aromas, while the palate layers flavors of cloves, leathery spice and red fruit. The elegant finish is dry and savory. From the younger vines in their organic vineyrads, The June Rouge has aromas of cherries, cooked plums, and black currants with a hint of violets coming from the Syrah. The palate is velvety and long with rich fruit and Christmas spices. Come Taste The ’05 Basciano Il Corto. Today at Madrona Wine Merchants we are tasting the ’05 Basciano il Corto. This bold Tuscan takes a price drop but is still tasting great. Was $22, now just $15. Pungent dried red berries complicated by rose and an intense cream soda quality on the nose. The cream soda follows through on the palate, joined by ripe red cherry and redcurrant. Finishes persistent and ripely tannic –IWC. The Rhône river is lined with vineyards that run up its banks into the mountains. In the cooler vineyards in the North Syrah is king. Farther to the South Grenache takes over along with an array of supporting grapes that add nuance and complexity to the wines. Join us on Saturday as we poke around the Villages of the Rhône and tour their distinct variations. They’re some of the most versatile food wines, and just delicious. Arnoux makes wine from its own vineyards in Vacqueyras as well as from purchased grapes. Their CDR Blanc is a dry and full white, with good body, nice floral notes and melony fruit. Domaine Montmartel is a fifth-generation family estate with 225-acres of vines located throughout Visan, Valreas, Tulette, and St. Maurice. They are in the process of converting their vineyards to organic. Their entry Rouge is a mid-body wine with lots of supple fruit and spice and a great match to a wide variety of food. The Andre family has owned vineyards in Rasteau since 1910, but has just recently rebuilt the winery on a steep slope so that all racking is done by gravity. Their Rasteau has lots of berry pie aromas and a good earthiness along with the characteristic spice and licorice notes. Named for the pilgrimage site in the Middle Ages for those wishing to be protected from the plague, Notre Dame des Pallières is a family estate with property in both Gigondas and Sablet. The old vines go deep in the limestone gravel soil. The Gigondas is complex, with spicy notes of clove, licorice, tobacco mixed with full supple fruit and fine tannins on the finish. Duevernay makes an assortment of wine from throughout the Rhone. Their Crozes Hermitage from the northern Rhône is grown on granite slopes with terraces bearing the rounded stones of the Rhône. It is unoaked and has a classic bouquet of red and black fruits, and spices. The palate is fruity and well balanced, long on the palate, tannic but smooth. Marche is a hilly wine growing region on the Adriatic Coast of central Italy, a rural area that has retained its own wine making traditions and local grape varietals. The combination of the ocean air and the soil of the region gives the grapes a unique character all their own. Saturday we’ll be exploring the region, trying some of the local delectables from such grapes as Verdicchio, Bianchello, Aleatico and Lacrima di Moro, as well as a unique and delicious local cherry wine. Colonnara practices sustainable agriculture respecting the natural habitat. Their Verdicchio has hints of green apple, grapefruit, kiwi and elegantly floral notes of acacia and mimosa. It is full-bodied with good balance and a lingering aftertaste of fruit and fresh almond. Morro d’Alba is a village with only 150 acres of the grape. Here the local grape Lacrima thrives. It has strong aromas of rose and violets along with notes of raspberry, pink pepper and oriental spices. It is nicely fruity and spicy on the palate, with smooth tannins, long velvety finish. The Orgiolo is the wineries Reserva being aged for 12 months in small second or third use French oak barrels. This distinct and tasty dessert wine is made from the local red wine is blended with wild cherries the following July. It’s very aromatic, full of mixed fruits and just plain delicious. From bone dry to syrupy sweet, Sherry is fortified wine made from the grapes Palomino Fino & Pedro Ximenez in southern Spain. Sherries are aged using a unique system called a solera. A solera consists of a series of wines of different ages. At bottling only a portion of each barrel of the oldest stock is drawn off, blended with other solera stock. The barrels are then topped from the barrels of the next oldest, which in turn are filled from the next oldest until they reach the youngest barrels which are filled with new wine. These new blends with time take on the characteristics or the older wine. The number of levels in a solera varies with each producer and style. This Thursday we are sampling some of the Solera Reserva Sherries of Lustau, one of the important sherry houses. We’ll have tapas on hand to accompany the wines. It should be a fun and tasty tasting. The Papirusa is bone dry, light and fresh, very tangy, clean and crisp with just a hint of saltiness. Served chilled, Manzanilla is great as an aperitif, or with oysters, Manchego cheese, or other appetizers. The Arcos is dry and soft, with hints of wood and smoky raisins and a distinctive nutty bouquet. It’s delicious on its own or can accompany a wide variety of dishes from light meat soups to seafood, game dishes and meat terrines. Amontillados should be served cool, but not too chilled. The Peninsula combines the finesse and delicacy of an Amontillado bouquet with the richness of an Oloroso. It is dry with rich flavors of light chocolate, coffee, figs and toffee. Served slightly cooled with cheeses and very rich meats such as venison and smoked game. Aged for 12 years in American oak casks through the traditional method of “solera and criaderas”, the Don Nuño has penetrating smoky aromas, and is reminiscent of dark chocolate and walnuts in the mouth. It has an intense and concentrated finish, lightened by a tangy acidity. The wine goes good with game, Osso Bucco and other meats as well as a digestif. In the past, casks of sherry that were lashed to ships sailing for the Indies as ballast were found to develop an extraordinary smoothness and complexity. Lustau revives this style in the East India Sherry. A blend of soleras averaging 15-20 years of age, this wine has a dark amber, red and caramel hue, and flavors of raisins, candied peel and nuts. 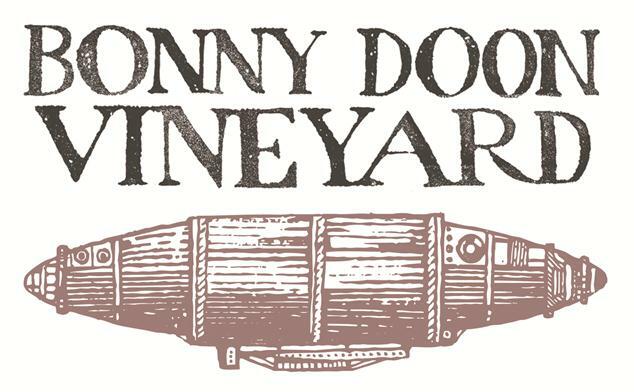 As you can see, Randall Grahm, owner and winemaker at Bonny Doon Vineyards has a way with words, and after tasting some of his portfolio you will find he has a way with wine as well. We had the pleasure of a visit from Randall last year to personally flog his wines. He is as fun in person as he is on paper. Pale yellow color with light gold highlights; bright floral notes of honeysuckle, lilac, and orange blossom bring to mind a perfumed spring garden at dusk. Ripe peach, melon, and yellow apple combine with citrus zest and spearmint on the palate. A brilliant and refreshing apéritif and a superb complement to seafood, poultry, charcuterie and cheeses, and Asian cuisine. A contrarian blend of mostly old-fangled grape varieties from older vineyards, located in Contra Costa County with aromas of cherries and licorice, flavorful cassis, blackberries and silky tannins. The strawberry-rhubarbity of grenache is complemented by a delicate note of kirsch from cinsault and the spicy catch of syrah’s white pepper. Brilliant rubescent pink with a fuchsia rim, the wine is intensely aromatic, with notes of strawberry, raspberry, pepper, and wild herbs. Supple and medium-bodied, the dominant flavors on the palate are of red fruits: strawberry, red currant, kirsch, and strawberry-rhubarb. Fruity and spicy but fully dry, this wine is the perfect foil for all manner of grilled meat or vegetables, roasted poultry, the aïoli platter (naturellement), and anything prepared al fresco-especially when anointed with olive oil. Randal Graham was one of the first California winemakers to create a Châteauneuf-du Pape style wine from California grapes. Le Cigare Volant has been his flagship wine for over two decades. Drink now or lay down for years. And who wouldn’t want to drink a wine whose name translates to The Flying Cigar, the literal French translation for spaceship. 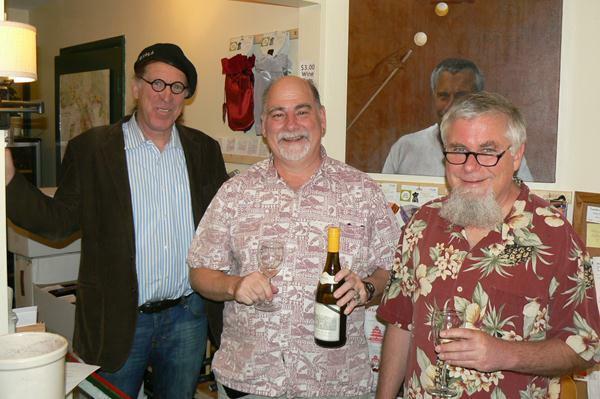 Mark and Jim with Winemaker and Bonny Doon owner, Randall Grahm at the shop last fall. Unfortunately he will NOT be able to join us for the tasting. Beat the post-holiday doldrums this afternoon by stopping by the shop. We have a lively new art show by Kelly Lyles and some very tasty and inexpensive wines from Burgundy and Beaujolais that we will be pouring starting at 2. To start the year off right, this Saturday we’ve pulled together a fine tasting of wines from Burgundy that won’t break the bank. Burgundies can be some of the most complex and layered wines in the world, but these aren’t them. They are however very tasty wines with a lot of nuance that you can drink every day. Albert Bichot is a large family run winery that owns 4 large estates in Burgundy and buys grapes from many others. But besides their prestigious cuvees they make this tasty table wine that blends the full fruit if the Chardonnay with the crisp fruit of the Sauvignon Blanc. It’s the life. This is the new vintage of a stalwart favorite of the shop. Blended from different vineyards in Côte de Beaune and Côte de Nuits with 25 to 35 year old vines, this Pinot has a fair bit of depth and complexity. The wine shows aromas of red currant, plum, and cherry. The flavor is full with a balanced acidity and a pleasant finish. Ferraud et Fills has passed from father to son for five generations. They make a range of Burgundies but are best known for their Beaujolais where Gamay is the dominate grape. The Moulin à Vent, a Cru or Village wine, has bright smooth fruit and lots of mineral due to the granite soils of the vineyards. The flavors are of Dark Raspberry, strawberry and black pepper. Originally $22, now just $15.